“ To the memory of my beloued, / The Author / Mr. William Shakespeare: / And / what he hath left us,” begins Ben Jonson’s second dedicatory poem to the first folio edition of Shakespeare’s works in 1623. And, as Remembering Shakespeare reveals, the question of what, precisely, he has left us has persisted over five centuries. Although the value of this legacy has seldom been in dispute, its meaning has never been fixed, whether in Shakespeare’s lifetime, or following his death, in the memories of his colleagues and contemporaries, or still later, as subsequent ages, including our own, continued and continue to remember and re-imagine him. Mr. William Shakespeares Comedies, histories, & tragedies. Published according to the true originall copies (London, 1623). From the collections of the Elizabethan Club, Yale University. “Reader, looke / Not on his Picture, but his Booke,” wrote Jonson. 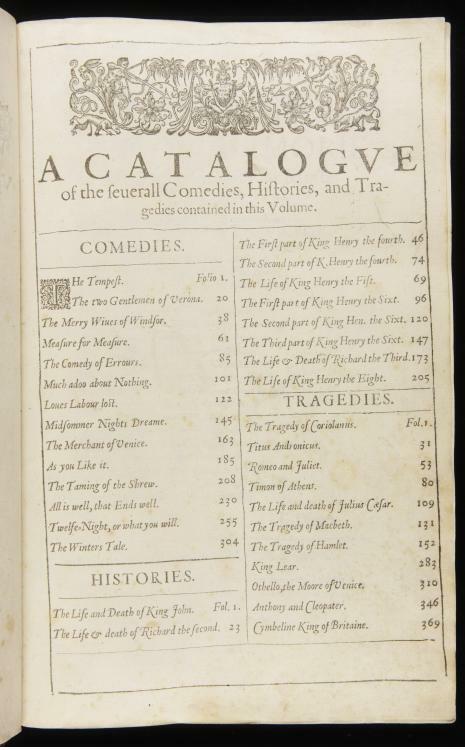 And yet, as the Yale University collections demonstrate, the publication of any book, let alone a book offering itself as a definitive edition of Shakespeare’s works, was only ever the consequence of the always unpredictable circumstances of both the theater and the print shop in which Shakespeare’s remarkable imagination was made visible to readers and audiences. In notebooks, in variant editions, in performances and adaptations, Shakespeare’s memory was written in always shifting lineaments, for motives which often had little if anything to do with Shakespeare’s own. And yet, the “Booke” of Shakespeare where, as Jonson knows, Shakespeare remains alive, became the book of all books. “Are you not an idolater of Shakespeare?” wrote the author Mary Russell Mitford to a friend in 1811, “I am sure you must be. I would rather give up all the other books that were ever written, retaining his alone, than sacrifice his and retain all the other works of all other authors.” And in 1926, the imagined Judith, Shakespeare’s sister, would for Virginia Woolf effortlessly invoke another universal: all the words not written, published, read, remembered, by authors who existed outside of a literary canon that had come itself to be epitomized by an author whose own works only circumstantially, and inevitably with the aid of others’ agency, came into print or performance. From Thomas Dowse’s late sixteenth-century quotation from Lucrece to Maynard Mack’s mid-twentieth-century Yale English 34 syllabus (and Walter Wilson Greg’s Shakespeare crossword puzzle) lies one trajectory of the many possible histories of the “Booke” of Shakespeare. 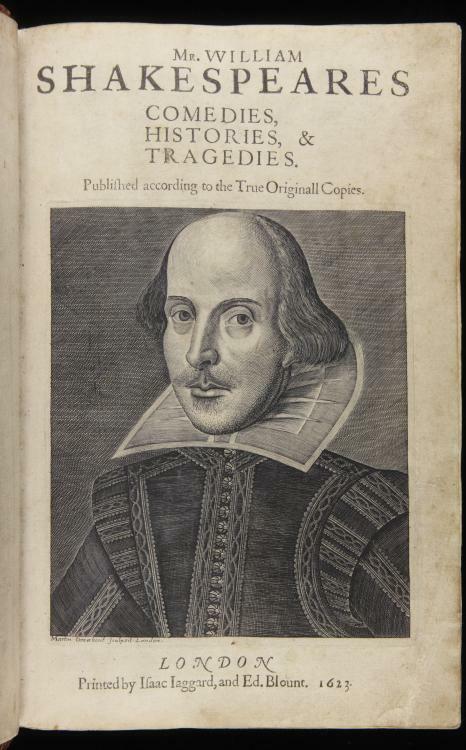 It is a history peculiarly traced through the material histories of the many books of Shakespeare, as, over the past three centuries, they have come together in the Yale University collections gathered in this exhibition. 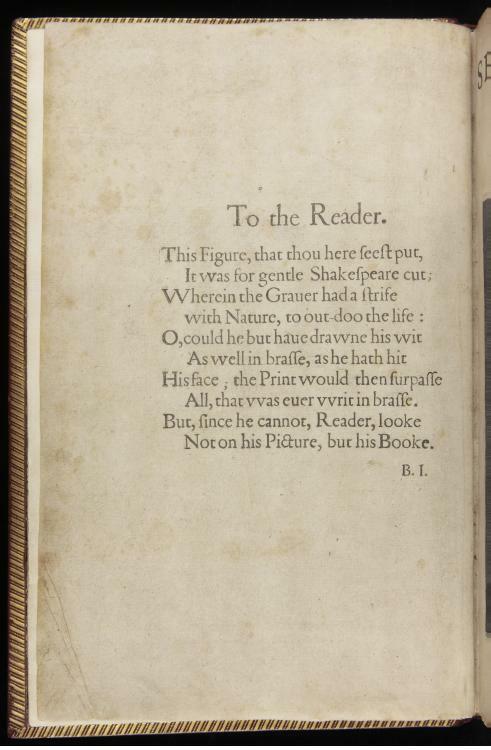 Much has been made of the First Folio, its tributes, especially Jonson’s “To the memory of my beloued/ The Avthor/ Mr. VVilliam Shakespeare:/And/what he hath left vs.” A critical rather than fulsome analysis would note that this strangely lettered and fonted title has seventeen letters. It has seventy-five characters. There are four V’s, where to be consistent there should be five. On the seventeenth line of the eulogy, the tribute actually begins. Shakespeare is mentioned four times, neither more than less. Seventeen authors are listed, one of them twice–Shakespeare–indicating that “Shakespeare” wrote under two names. What could all these purposeful arrangements mean? Without exhausting the numerous references AWAY from Stratford’s William Shakspere, we may note from the above paragraph, direct suggestion towards the SEVENTEENTH earl of Oxford, who was Edward de Vere. Vere/Vier/four occurs in terms of four V’s in the seventeen-word title. The total number of printed characters, seventy-five, add up to twelve, 7+5, the number of letters in the title “earl of Oxford” or the name Edward de Vere. We may plausibly conclude that the title and poem itself was an ambiguous document, whose purposes were divided between treating the Author as though he were Shakespeare and that person might be Shakspere of Stratford, and also to convey covertly who the actual author was. Not Shakspere, who had associated with a known bordello owner, as slyly mentioned in the beginning of the tribute, but Edward de Vere, 17th earl of Oxford, whose life and career perfectly matches the Shakespeare canon.